William Arthur Blog: Enter our “Dear, Mom” Pinterest Contest! Enter our “Dear, Mom” Pinterest Contest! To celebrate two exciting special occasions — our new Vera Wang boxed stationery launching online and Mother’s Day — we’re hosting a Pinterest contest! 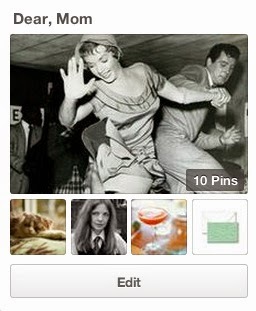 Simply create a board of 10 pins or more inspired by your own mom and the things she loves. Be sure to incorporate one pin from our 2014 Boxed Collection board. Name it “Dear, Mom” and email us the link to submissions@crane.com by midnight on Thursday, May 15th. Check out our example board here. On May 16th, we’ll pick three random winners, who will each receive two boxes (one for you, one for mom, of course) of the Vera Wang stationery they used on their boards. Be sure to check our Facebook page that day for the winners. Good luck! By entering the “Dear, Mom” Pinterest contest, the contestant grants Vera Wang Papers permission to promote the contestant’s name and submission for marketing purposes. Slight alterations may be made by staff in order to fit size restrictions on our digital marketing platforms. The contest ends at 11:59 p.m., EST on Thursday, May 15th. Entries must be received before the end of the contest to be eligible. Any received after this date will be disqualified. Only one Pinterest board per contestant is permitted, and it must be submitted via email. Winners will be selected at random. Vera Wang Papers reserves the right to refuse any board they deem unacceptable for any reason. Contestants will be responsible for obtaining any and all consents, approvals and licenses required in connection with their participation in the contest. Vera Wang Papers expects to select winners on or around Friday, May 16th. Winners will be informed via email and the prize will be released within two weeks of the announcement. If the winner does not respond within 48 hours of being contacted, a new winner will be chosen. By entering the contest, contestants are automatically signed up for the monthly William Arthur e-newsletter. The five winners will each receive two boxes of Vera Wang boxed stationery. Vera Wang Papers reserves the right to substitute a prize of equal or greater value. The winner may not exchange the prize for cash or any other merchandise or service. Contestants are granting Vera Wang Papers an irrevocable, royalty-free, worldwide right and license to use their entry in connection with the contest and feature their entry and all its content in connection with the contest in all media (now known or hereafter developed). Contestants agree to sign any necessary documentation that may be required for us and our designees to make use of the rights contestants grant above. Contestants will not receive any compensation or credit for use of their entry, other than as described in these terms and conditions. The potential winner may be required sign an affidavit of eligibility, a liability/publicity release and other documentation. If the potential winner does not and return these required forms within the time period stated on the winner notification message, Vera Wang Papers may disqualify that person and select an alternate winner. Vera Wang Papers is not responsible for any unauthorized use of contestants. By entry in this contest, each contestant is, to the extent allowed by law, releasing and holding harmless William Arthur and its subsidiaries, affiliates, employees and agents from any and all liability arising from or in connection with the contest or any prize won. You are not eligible to participate in the contest if you are an employee or an immediate family (parent, sibling, spouse, child) or household member of Crane Stationery or any of its subsidiaries, or a person involved in any part of the administration or execution of the contest. This contest is void in Puerto Rico and wherever else prohibited.